"...We, inmates currently housed in Administrative Segregation Unit (ASU) of CSP (California State Prison) Corcoran, hereby petition California Department of Corrections and Rehabilitation Director Matthew Cate and Corcoran State Prison Chief Deputy Warden C. Gipson for the redress and reform of current inhumane conditions we are subjected to which violate our constitutional rights. 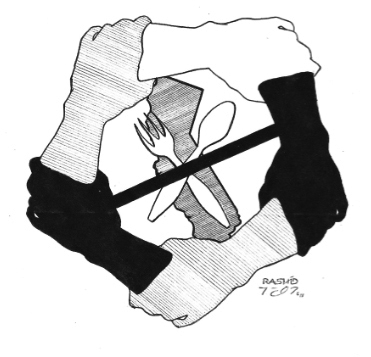 Furthermore, this petition will serve as a constructive notice for the peaceful protest which will be carried out as an alternative means of petition in the event that our conditions and demands are not met in a timely manner..."
This drawing by Rashid Johnson, a prisoner in solitary confinement in Red Onion Prison in Virginia, was created to symbolize the California hunger strikes that started July 1, 2011, resumed Sept. 26 and now have resumed again on Dec. 28 at Corcoran State Prison. It has become the icon of this prisoners’ rights movement. We, inmates currently housed in Administrative Segregation Unit (ASU) of CSP (California State Prison) Corcoran, hereby petition California Department of Corrections and Rehabilitation Director Matthew Cate and Corcoran State Prison Chief Deputy Warden C. Gipson for the redress and reform of current inhumane conditions we are subjected to which violate our constitutional rights. We are daily being subjected to sensory deprivation which imposes a substantial risk of serious harm to our mental health. As established in numerous scientific studies, prolonged subjection to sensory deprivation has serious adverse effects to one’s mental health. We are subjected to these conditions for months and even years. Our numerous attempts to address this problem by filing 602s are being shut down. The officials are acting with deliberate indifference to our health and well-being, and our Eighth Amendment right to be free from cruel and unusual punishment is being violated. Although mandated by a court order to allow inmates in ASUs to possess an entertainment appliance, CSP Corcoran officials refuse to do so citing a memorandum dated Dec. 15, 2008, that permanently exempts a number of prisons, including CSP Corcoran, from having to comply with the court’s mandates due to their “current fiscal situation and costs to retrofit housing units.” This policy is illegal, for our constitutional rights must be protected regardless of CSP Corcoran’s financial problems or the costs to make necessary installations to protect those rights. Also, the aforementioned exemption memo states that CSP Corcoran is permanently exempt from allowing the use of entertainment appliances in the ASU. The only explanation provided on how and why this prison is exempt is a brief mention of the current fiscal situation of the prison. There is no mention of any follow-ups in a set period of time – e.g., every six months – in which the prison’s budget will be reviewed by the Division of Adult Institutions to see whether the prison still qualifies for the category that justifies exemption. In other words, once a prison “passes the test” by showing that they currently cannot afford the costs to retrofit the housing units and get accepted in the “exemption list,” that prison is permanently exempt regardless of their financial situation in the future. This exemption policy is clearly unreasonable, and we assert that this policy is merely used as a loophole to get around the court’s mandates to allow us our entertainment appliances. Furthermore, the exemption memo cannot apply to us because there is no extensive retrofitting required for giving us our radios. The electric outlets are in place and the radios merely need to be distributed and plugged in to work. A) CSP Corcoran officials immediately allow us to possess and/or stipulate to allow us to possess our TVs within two months. B) CSP Corcoran officials make the necessary installations and/or stipulations needed to allow us to possess our TVs within two months. The ASU law library is inadequate. Its contents do not comply with CCR (California Code of Regulations) Title 15 §3121 and DOM (Department Operations Manual) §53060.11. There is only one computer that contains the only essential law books in the law library, which is supposed to be shared by 200 inmates. This results in unreasonable delays with inmates not being able to sufficiently access the law library. There is only one computer that contains the only essential law books in the law library, which is supposed to be shared by 200 inmates. Furthermore, there is no copy machine in the ASU law library. All our legal copies are therefore forwarded to the 4A facility law library for copying. This results in delays of days or even weeks for us to receive our copies back. Also, there have been instances where our copies have been lost resulting from this unreliable practice. A) CSP Corcoran officials allow us access to an adequate law library and reasonable amount of time to use such law library by: 1) Ordering and replacing all current law books listed in CCR Title 15 §3121 and DOM §53060.11 which are missing from the ASU law libraries contents, or 2) Installing three more computers that contain essential law books for inmate use, or 3) Providing us with adequate legal assistance from persons trained in the law. B) CSP Corcoran officials install a copy machine in the ASU law library for its use for legal copies and all essential legal supplies be kept in stock. Inmates are being placed in the ASU after the completion of their SHU terms supposedly “pending transfer.” These inmates are then stuck here for four, five months, in many instances even longer, before finally being transferred to general population. This practice of illegally placing inmates in ASU upon the completion of their SHU terms for long periods of time without proper procedure and with excessive delays on their transfers is resulting in unjustified punishment for these inmates. Furthermore, inmates undergoing the DRB (Departmental Review Board) process after the completion of their SHU terms are being held in ASU for months and even years while the counselors and committee ignore their repeated requests for a timely hearing on their case. This is in blatant violation of their procedural due process rights. Inmates undergoing the DRB (Departmental Review Board) process after the completion of their SHU terms are being held in ASU for months and even years while the counselors and committee ignore their repeated requests for a timely hearing on their case. The inmates submit numerous inmate requests to ASU counselors regarding the delays on their transfers and/or DRB process, but those inmate requests are not being responded to and are being ignored. The counselors are not doing their jobs because of their incompetence and/or negligence; we are suffering these undue delays explained above. A) The counselors here in ASU do not unreasonably delay inmates’ transfers and DRB process and respond to inmate requests in a timely manner. B) Inmates who are placed in ASU after the completition of their SHU terms be afforded the same privileges as those inmates who are classified as A2-B inmates, which includes but is not limited to quarterly packages, one phone call per month and $120 monthly canteen draws. Medical staff here in ASU unjustifiably delays medical attention and denies proper medical treatment for inmates. Although required by the court’s order in Coleman/Plata v. Schwarzenegger to provide us with adequate medical care, which the CDCR has failed to provide before, CSP Corcoran’s medical department is not in compliance with the court’s mandates. We are suffering violations to our Eighth Amendment rights daily for lack of adequate medical care, and our health and well-being are severely jeopardized. Furthermore, we are having difficulties pursuing timely medical appeals and grievances. The medical appeals coordinators do not follow time requirements set forth in CCR Title 15 §3084.6 and there are substantial delays on getting responses for our appeals. A) Inmates be provided with timely medical attention upon request and provided with adequate medical care as mandated by the court in Coleman/Plata v. Schwarzenegger. B) Medical appeals be promptly responded to pursuant to CCR Title 15 §3084.6. We are being placed in ASU and sentenced to SHU terms without being afforded due process of law. The hearing officers automatically find inmates guilty regardless of the sufficiency or insufficiency of the evidence, and their biased perspectives and opinions go unchallenged. Although the hearing officers are acting as lawyers and/or triers of fact in 115 hearings on the question of guilt, clearly under the guidelines of established case law concerning due process, they are not required to be trained in the law nor registered with the State Bar. Resulting from their lack of knowledge and competence in this matter, frivolous and false charges not supported by any reliable evidence, which would be thrown out in a court of law, are being upheld and imposed on us. This violates our 14th Amendment rights to due process. A) Hearing officers be required to follow guidelines established by the courts concerning due process, burden of proof and sufficiency of evidence when conducting 115 hearings. B) Hearing officers be trained in the law so they may be deemed competent to carry out the duty of a trier of fact in 115 hearings. Inmates placed in ASU are not allowed access to phones. The only way we are allowed to maintain family and community ties are by writing letters and receiving visits. Not all of us are literate, and not all of us get visits. So the denial of phone access is depriving many of us of the only way to keep in contact with our families and loved ones. The denial of phone access is depriving many of us of the only way to keep in contact with our families and loved ones. Furthermore, those of us currently litigating cases who need access to the phone to contact witnesses, private investigators, attorneys, courtroom clerks etc. are not allowed phone access. This results in an impingement on our First Amendment rights to access to the courts. A) Inmates in ASU be allowed one phone call a month on an inmate telephone pursuant to CCR Title 15 §3282(a)(3). B) Inmates in ASU be allowed confidential calls pursuant to CCR Title 15 §3282(g). We are being denied adequate laundry exchange. There are weeks where laundry exchange is not run; most of the time during laundry exchange they are short on pillow cases, sheets and towels; and we are only allowed to turn in one of each item for laundry exchange. This clearly is not in accordance with CCR Title 15 §3031(b). A) We be provided with a weekly laundry exchange pursuant to CCR Title 15 §3031(b). Our canteen is being opened and food items – such as rice, soups, cookies, chips, beans, etc. – are being placed in paper bags before they’re given to us. This attracts ants and insects that go into the bags containing food and thereby pose a serious health risk. Furthermore, the food becomes stale and inedible after a few days due to the food being placed in paper bags. A) Inmates be allowed to keep their canteen items in the plastic bags they come in and/or be allowed to purchase zip lock plastic bags from the canteen to place the food in. Inmates in ASU are not allowed any educational and/or rehabilitative programs and/or opportunities. There is no school; we are not allowed to receive any form of correspondence course for lack of proctors, those of us who wish to learn a trade are not able to and those of us who wish to better ourselves to be better individuals of benefit to our society and other citizens are not given that chance. Inmates in ASU are not allowed any educational and/or rehabilitative programs and/or opportunities. Furthermore, we are currently not allowed TVs, so we are not able to partake in educational opportunities by watching educational channels or programs or participating in educational programs that are provided by the institution on the institutional channels. This contradicts what CDCR supposedly stands for, which is to make the communities safer and rehabilitate our prisoners. We wish to better ourselves by participating in educational and/or rehabilitative programs, but we are denied this right. A) We are afforded educational programs such as correspondence courses, proctored exams, vocational courses etc. B) We are afforded rehabilitative programs in self-help, Alcoholics Anonymous, Narcotics Anonymous etc. C) We be allowed to possess our TVs for educational purposes such as to partake in educational opportunities provided by the institutional as well as educational channels. The inmates housed in the SHU are allowed certain privileges and items from canteen and packages that we are not allowed. These privileges include but are not limited to TVs; educational courses; beanies, sweats and shoes from package; photo ducats; and art supplies from canteen such as colored pens, pastels and sketch pads. Furthermore, SHU inmates are allowed exercise equipment in the yard cages, such as pull-up and dip bars. Inmates housed here in ASU are D1/D assigned, same as the SHU inmates. Most of us are stuck in this ASU for months and even years. The fact that we currently are not afforded the same rights and privileges as SHU inmates violates our equal protection rights. We are exercising our legal right to petition in participating in a peaceful protest. This right is protected by the United States Constitution and thereby any sanctions and/or reprisals placed on us for the reason stated above is illegal and a violation of our rights. A) No reprisals be taken on petitioners in any form or manner for the exercise of our right to petition. We petitioners are not deprived of our constitutional rights simply because we are incarcerated behind these prison walls. We are bound by the Constitution of the United States, and therefore its protection extends to us as well. These rights have been violated and disregarded by CDCR and CSP Corcoran officials and therefore petitioners, with the support of members of their class, hereby come together to demand the redress and remedies that have been long overdue. We are bound by the Constitution of the United States, and therefore its protection extends to us as well. Petitioners pray that this petition and the issues addressed herein are remedied and the relief sought in each demand granted. This petition was sent to S. Vargas to be forwarded to the Bay View. It was typed by Kendra Castaneda. Readers are urged to write to these brothers on hunger strike. Hunger strike Round 2, Day 3: 6,000 on strike, threats from CDCR Repression breeds resistance!